Could The Toyota FT-4X Concept Preview A Reborn FJ Cruiser? The image you’re looking at could potentially be a ray of hope for off-road fans, specifically those of the dearly departed Toyota FJ Cruiser. Toyota has just released this teaser image of its upcoming FT-4X Concept ahead of its live New York Auto Show debut. At this point we know literally nothing about the concept itself, only that it wears a set of off-road ready 18-inch Goodyear 225/55 tires. So that’s a good sign Toyota will debut a concept whose intention is to gauge public interest in a potentially new off-roader. 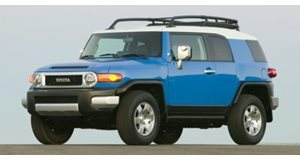 The FJ Cruiser ended production back in 2014, but with gas prices down again in the US, there’s been a resurgence in SUV and pickup truck sales. For example, Ford will launch a reborn Ranger pickup truck in 2019, followed by a new Bronco SUV in 2020. The Bronco at least is expected to be built on a body-on-frame chassis. Along with the FT-4X Concept, Toyota will unveil an updated Sienna minivan and Yaris. Unfortunately, no reborn Supra just yet, but we’re pretty anxious to see what Toyota has in mind regarding its upcoming off-road lineup. We’ll have our answer next week from New York. Stay tuned.